Time passes so quickly, especially in the morning. Your hands are so busy brushing your teeth and checking the weather on your smartphone. You might wish that your mirror could turn into a touch screen and free up your hands. That wish can be achieved very soon. 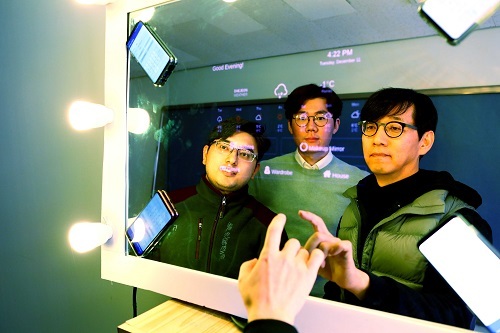 A KAIST team has developed a smartphone-based touch sound localization technology to facilitate ubiquitous interactions, turning objects like furniture and mirrors into touch input tools. This technology analyzes touch sounds generated from a user’s touch on a surface and identifies the location of the touch input. For instance, users can turn surrounding tables or walls into virtual keyboards and write lengthy e-mails much more conveniently by using only the built-in microphone on their smartphones or tablets. Moreover, family members can enjoy a virtual chessboard or enjoy board games on their dining tables. Additionally, traditional smart devices such as smart TVs or mirrors, which only provide simple screen display functions, can play a smarter role by adding touch input function support (see the image below). Figure 1.Examples of using touch input technology: By using only smartphone, you can use surrounding objects as a touch screen anytime and anywhere. The most important aspect of enabling the sound-based touch input method is to identify the location of touch inputs in a precise manner (within about 1cm error). However, it is challenging to meet these requirements, mainly because this technology can be used in diverse and dynamically changing environments. Users may use objects like desks, walls, or mirrors as touch input tools and the surrounding environments (e.g. location of nearby objects or ambient noise level) can be varied. These environmental changes can affect the characteristics of touch sounds. To address this challenge, Professor Insik Shin from the School of Computing and his team focused on analyzing the fundamental properties of touch sounds, especially how they are transmitted through solid surfaces. On solid surfaces, sound experiences a dispersion phenomenon that makes different frequency components travel at different speeds. Based on this phenomenon, the team observed that the arrival time difference (TDoA) between frequency components increases in proportion to the sound transmission distance, and this linear relationship is not affected by the variations of surround environments. Based on these observations, Research Assistant Professor Hyosu Kim proposed a novel sound-based touch input technology that records touch sounds transmitted through solid surfaces, then conducts a simple calibration process to identify the relationship between TDoA and the sound transmission distance, finally achieving accurate touch input localization. The accuracy of the proposed system was then measured. The average localization error was lower than about 0.4 cm on a 17-inch touch screen. Particularly, it provided a measurement error of less than 1cm, even with a variety of objects such as wooden desks, glass mirrors, and acrylic boards and when the position of nearby objects and noise levels changed dynamically. Experiments with practical users have also shown positive responses to all measurement factors, including user experience and accuracy. The proposed system was presented at ACM SenSys, a top-tier conference in the field of mobile computing and sensing, and was selected as a best paper runner-up in November 2018.